Here’s more of my imagined conversations between my books. For an explanation of this, see here and here. 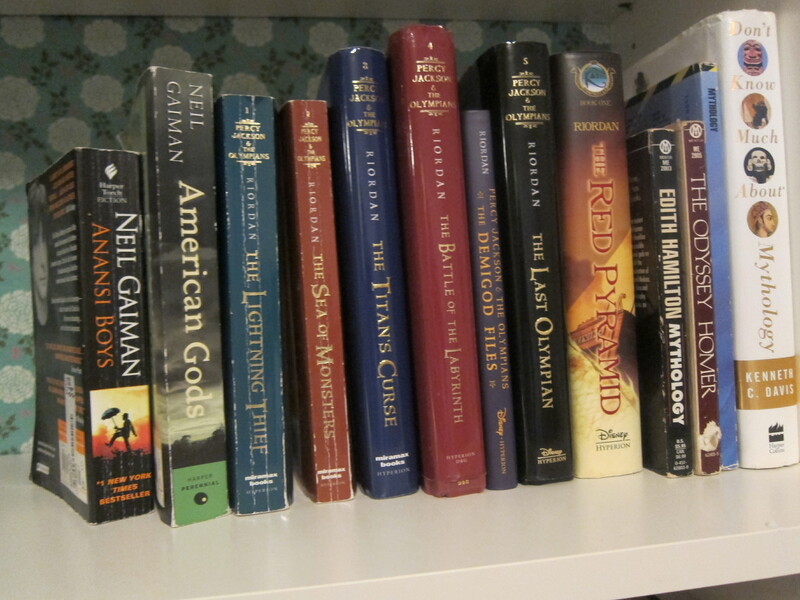 Here we have the mythology shelf, where two very different males engage in personal odysseys through a modern world populated by the ancient gods. Teenage Percy Jackson and his pals might be frightened by hardened criminal Shadow from American Gods. True that Percy’s faced down snake-headed ladies and fought death itself, but Shadow’s a little rougher around the edges. Shadow would probably order a straight vodka with his breakfast and Percy would say, “Uh, I’ll have OJ. Straight.” Shadow would smile and say something manly and Percy would shoot a panicked look at Annabeth, who would roll her eyes and reach for Edith Hamilton’s Mythology to correct everything it got wrong. 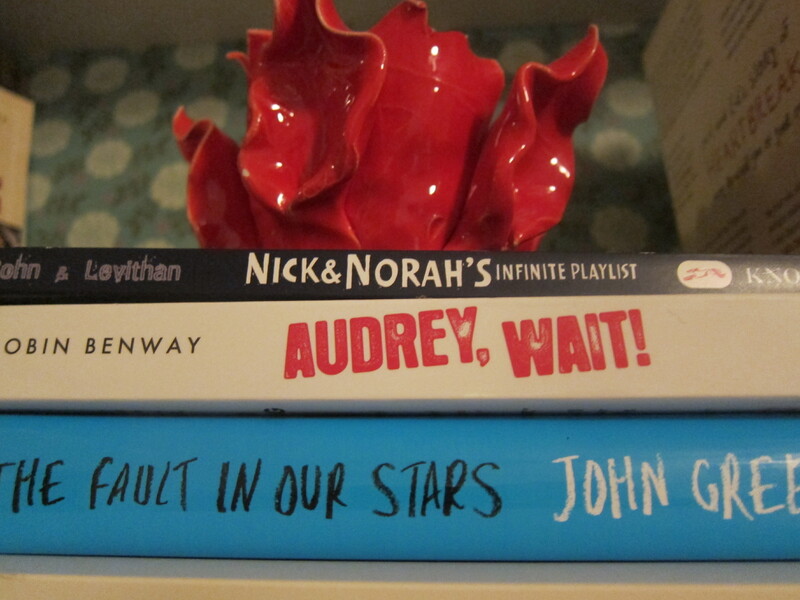 Here we have a little stack of nice YA romances, and I’d like to send all of them on a triple date together. True that one of them is dead (I won’t say who), but we’ll pretend they’re all alive and healthy enough to sit around a table at a kitschy diner with a fantastic jukebox. Nick and Norah would be engaged in lively debate about music with Audrey and James, and Hazel and Augustus from The Fault in Our Stars would share a milkshake and grins while they listened. Eventually the talk would turn to bad ex-boyfriends and girlfriends, Augustus would impishly play “Audey, Wait,” and the whole group would end up dancing like maniacs. This is where the upper class hangs out. Naturally, Emma is holding court in the middle and happily telling the Annes from Persuasion and Jane Austen in Scarsdale exactly who they should marry and when. The Annes are making eye contact over head and rolling their eyes. Luckily, Emma has a couple of disciples in Megan from How to Teach Filthy Rich Girls and basically all of the teenagers in Sweet Valley. Emma would really like to be sharing tea with Gatsby, but he considers her to be too frivolous and the rest of them to be too nouveau riche for his tastes. Jessica Wakefield is confident she’ll be BFFs with Daisy though because Jessica Wakefield is delusional. 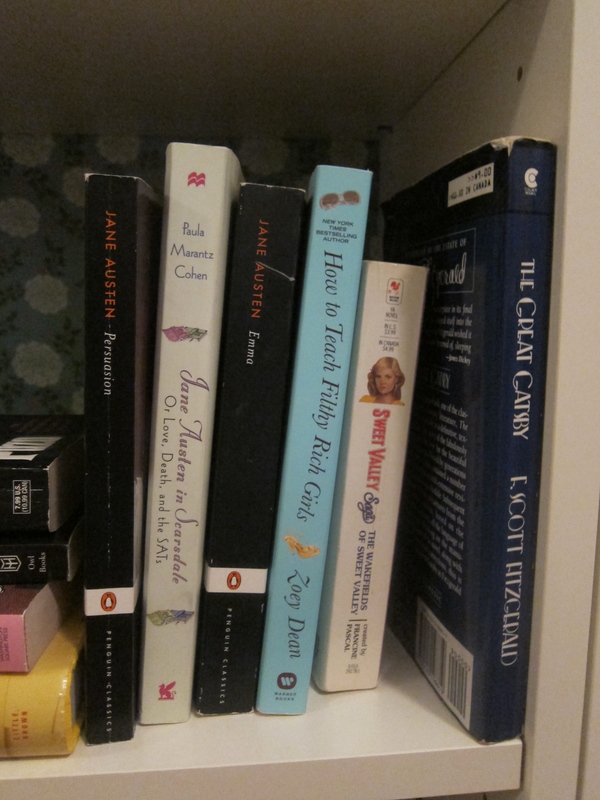 Posted on June 18, 2012, in Books and tagged american gods, Audrey Wait, bookcase, emma, jane austen, john green, mythology, neil gaiman, nick and norah, obsessive organization, percy jackson, persuasion, sweet valley, the fault in our stars, the great gastby. Bookmark the permalink. Leave a comment.